PC-Rot Terminator® Epoxy Rotted Wood Hardener is for wood that has structural damage caused by insects or rot. The mixture of resin and hardener produces a low viscosity liquid that penetrates the distressed wood and cures hard. It is slow curing, allowing time for the liquid to deeply penetrate the wood. It has zero solvents or volatiles. Beams, columns, railings, decking, porch boards, balconies, outdoor furniture, play equipment, steps, window frames and sills, boats and docks, concrete, brick, stone, plaster and more. PC-ROT TERMINATOR® | 3.25 oz. Remove loose paint, wood fibers and debris with stiff brush or scraper. Wood should be fully dry. Wet or damp wood or wood treated with glycol based wood preservatives will decrease PC-Rot Terminator’s® ability to soak-in. PC-Rot Terminator® does not displace water from inside damp wood. Ventilate the wet wood using a fan and if necessary safely warm with infrared heat lamp to speed drying. Painted surfaces must be drilled or sanded to expose damaged wood. Vertical surfaces should be drilled on a downward angle (45 degree) with 1/8 to 1/4 inch bit to access the wood grain. Clean up mixed epoxy before it cures with paper towels and solvent. Denatured alcohol (ethanol), acetone, rubbing alcohol (isopropyl alcohol) or lacquer thinner are suitable solvents for removing uncured epoxy. 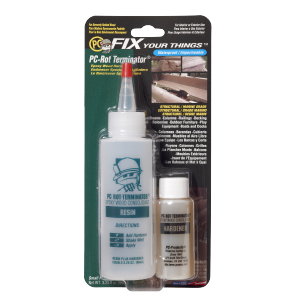 Cured epoxy can be removed with paint stripper or remover. How deeply does PC-Rot Terminator® soak-in? How deeply PC-Rot Terminator® soaks in is dependent on the condition of the wood. Severely damaged wood will allow greater penetration. Does PC-Rot Terminator® change the wood color? PC-Rot Terminator® is amber color and will make wood darker. Can PC-Rot Terminator® be used to seal the end grain of a pile or post? PC-Rot Terminator® is an excellent epoxy sealer. What is the lowest temperature that PC-Rot Terminator® can be applied? Highest? PC-Rot Terminator® works best with temperatures above 60°F and below 100°F. Low temperatures will cause the PC-Rot Terminator’s® viscosity to increase and take additional time to cure. High temperatures will cause the chemical reaction to accelerate and decrease the working time. Do not apply until temperatures reach 45°-50°F. Can solvent be used to reduce the viscosity? Reducing the viscosity with acetone is possible but will lower the strength, slow down the cure and possibly cause shrinkage. 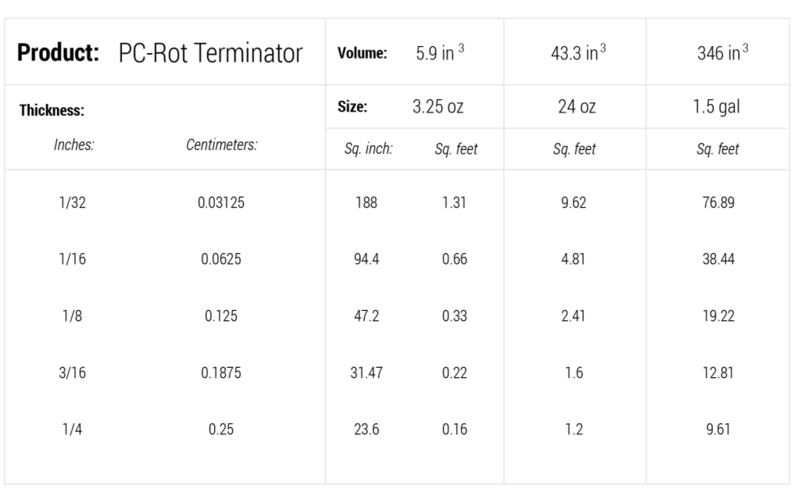 Does PC-Rot Terminator® work on particle board? Plywood? Particle board and plywood are combinations of wood and glue. These materials are more difficult for PC-Rot Terminator® to penetrate than natural wood. PC-Rot Terminator® is slow curing. How long until PC-Woody® can be applied? Apply PC-Woody® after the PC-Rot Terminator® has fully soaked in. Because it is slow curing any PC-Rot Terminator® that does not soak in completely may remain wet temporarily. How much PC-Rot Terminator® should be applied? Apply PC-Rot Terminator® until the wood is fully saturated. Reapply until the wood cannot absorb more liquid. 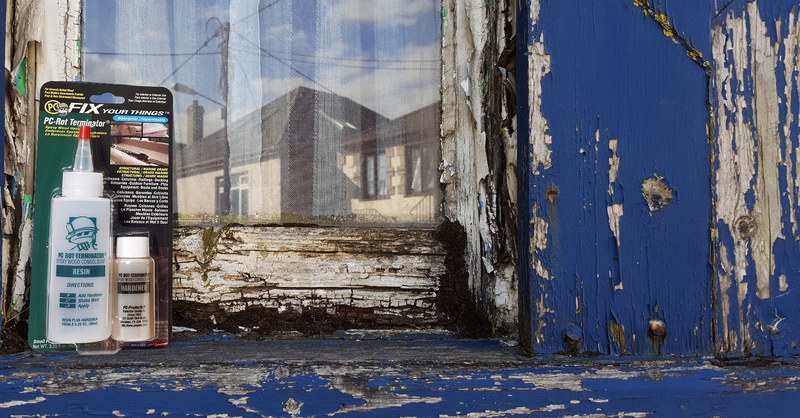 There is a limited time that PC-Rot Terminator® can penetrate before it begins to thicken so it is important to thoroughly soak the wood repeatedly to get the maximum hardening effect. The PC-Rot Terminator® remains sticky after 24 hours. PC-Petrifier® is slow curing and will remain tacky for up to 24 hours at 70°F. Cooler temperatures will delay the curing reaction and cause the PC-Rot Terminator® to remain tacky. Is PC-Rot Terminator® stronger than PC-Petrifier®? PC-Rot Terminator® is 100% epoxy resin and epoxy hardener. In most applications it hardens wood to a greater effect than PC-Petrifier® which contains water. The mix bottle is cured with left over epoxy. Now what? Cured PC-Rot Terminator® in the bottle cannot be removed. Had the bottle been rinsed and fully emptied, it could have been reused. PC-Rot Terminator® is mixed by volume: 2 measures of Resin to 1 measure of Hardener. For example, use a medicine cup to measure.